Mata Amritanandamayi Math, is situated at Amritapuri in Vallickavu, a small fishing village near Quilon (Kollam), South Kerala. 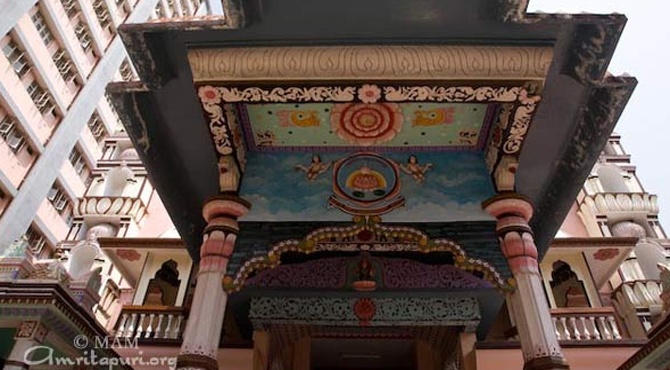 The ashram which houses more than 2,500 disciples and householders as full-time residents is located at the site of the birth place and childhood home of Mata Amrithanandamayi or Amma or Ammichi as she is popularly known. Thousands of people around the world come to experience her unique 'darshan', in which she holds each devotee in her arms like a mother embracing a child. Mata Amrithanadamayi's principal teaching is not her words, but the experience of being with her. She has a special earthy aura a sense of peace about her, a special healing touch, experienced by people who come to see her or receive her 'darshan'. Amma gives darshan on Wednesdays, Thursdays and Saturdays. She personally receives every person who comes to her with a radiant smile, talking to them, consoling and blessing them finally giving them a divine motherly hug. She is been known to embrace over 15,000 devotees in one night. On Sundays Amma gives a special 'Devi Bhava' darshan, a ritual in which she dresses in a spectacular costume and a crown, enters a trance and assumes the form of the Divine mother. This special darshan lasts the whole night past sunrise the next morning. Her devotees believe her to be an incarnation of the Hindu Goddess Kali. Some of them even worship her picture or small Ammachi dolls. 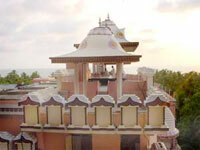 Tuesdays and Fridays are set aside for ashram residents when Amma comes to the temple to give them 'Satsang'. The daily routine at the ashram starts in the early morning at around five with the devotional chanting of 'Lalitha sahasranama' accompanied by the tabla and harmonium followed by Scripture classes, meditation, bhajans till the evening, with breaks in between. When Amma is in the ashram and not giving darshan, she is leading the ashramites in meditation, instructing them in their spiritual practices and edifying them with her immortal wisdom. She leads the bhajans in the evenings or devotional chanting, with infectious passion and abandon flinging her arms in the air as she cries out rapturously, the names of god and goddesses. The devotees also gets into the Bhakti mood sharing her passion. There are also classes in yoga, Sanskrit, Vedanta and meditation. All visitors are required to sign up for daily 'karma yoga' (selfless service) which means simply work, including cleaning, food preparation etc. in the ashram. When Amma is at the ashram, the place buzzes with activity with the large volume of devotees and the frequent singing of bhajans. Amma is generally out of the country from mid May until mid August as well as from early November until early December. 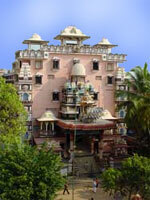 The ashram, now the headquarters of Amma's world wide mission, runs a number of charitable, medical and educational programs, including an orphanage, a free housing program for poor widows, and a hostel for tribal children, a hospice for cancer patients, a five hundred bed hospital, an ayurvedic clinic, a computer technology institute and a technical school at the premises as well as ashrams or centres throughout India and abroad. Through its branch ashrams, the math conducts regular medical camps, programmes for feeding the poor, distributes pensions to impoverished women, and builds free homes for the poor. The branches also assist in the collection and distribution of free clothes and school books, and some arrange scholarships for deserving children who would otherwise not be able to attend school. The math has centres in 28 countries including USA, UK, UAE, Australia, Canada, France, Germany, Japan etc.